Australia's Own $ales $cript Book The Hottest Selling Tool! There is just ONE real difference explaining why super achieving sales people sell 10 times as much as the average sale person - and extensive international research continues to confirm that when this sales secret is implemented, average sales people become super achievers. That ONE difference is that super achievers use scripting when selling - saying the right thing at the right time, each time they are in front of a prospective purchaser. And the answer to becoming a super achieving salesperson is easily found in the leading Australian sales resource The Australian Sales Script Book developed by Australians for Australians. For over 20 years The Australian Sales Script Book has set the careers of thousands of average sales people on the pathway to becoming super achievers. What is a Sales Script Book? The Australian Sales Script Book is a collection of the most powerful and useful phrases (scripts) a sales professional can use to counter any objection and close the sale. A custom tailored Sales Script Book can cost a company upwards of $2,000.... and more. It is no coincidence that sales superstars, some of who earn in excess of $1 million a year, all use Script Books. 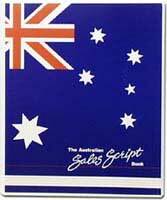 The Australian Sales Script Book makes the job of selling easier and less stressful. While your competitors are racking their brains to think up an on-the-spot response to an objection or stall, you can simply glance down the page in the appropriate Australian Sales Script Book section and find the right response to a sure close. The Australian Sales Script Book contains hundreds of tested sales Scripts. You can now benefit from many years worth of research and purchase your own, generic Australian Sales Script Book You know about the high cost of customised Sales Script Books. They run between $15,000 to $35,000. Now you can get our generic Australian Sales Script Book at the special Digital download price of AUS$75.